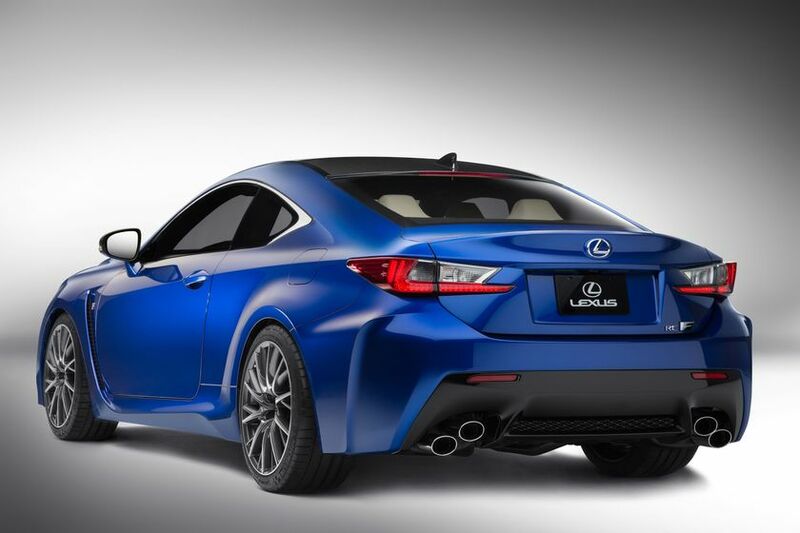 (Janurary 14, 2014) - Lexus has revealed the high performance version of its new RC coupe at the North American International Auto Show in Detroit. 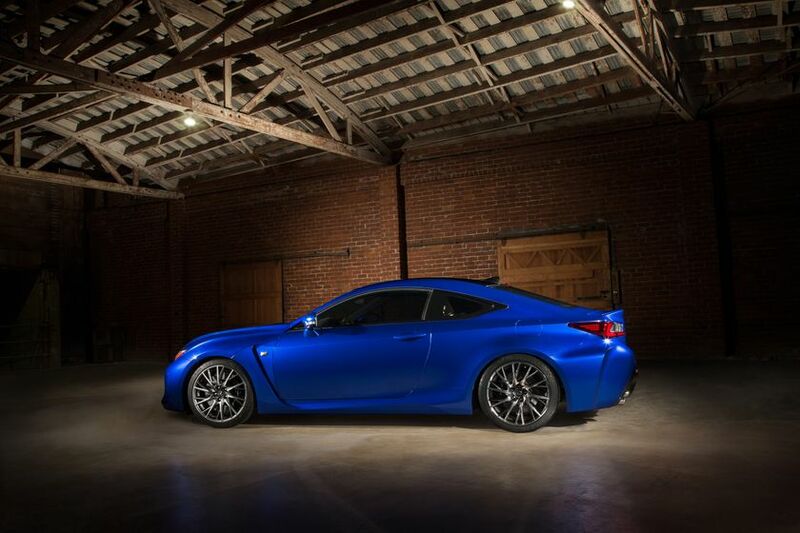 The Lexus RC F is the most powerful Lexus V8 yet, with engine power well above 450hp and torque above 520Nm. 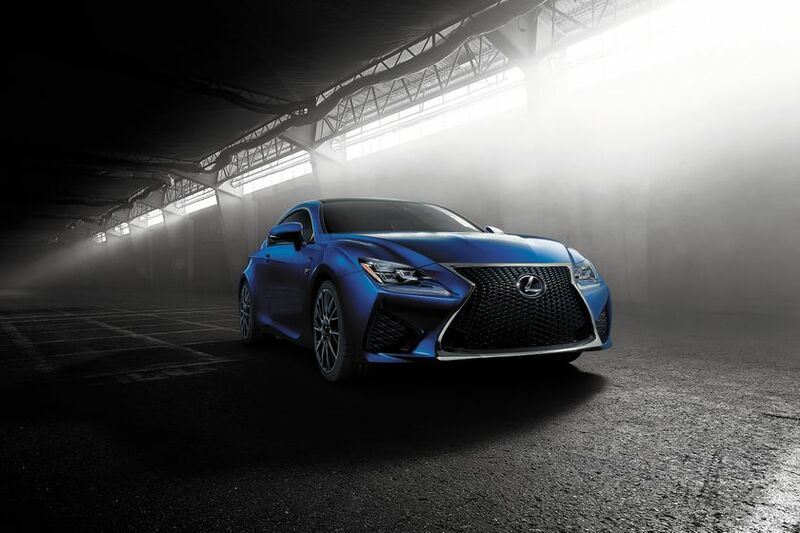 To get that amount of power efficiently to the ground, the RC F will make world-first use of a Torque Vectoring Differential (TVD) in a front engine rear drive car to guarantee extraordinary levels of handling and performance. The power will transfer through a newly calibrated eight speed transmission. 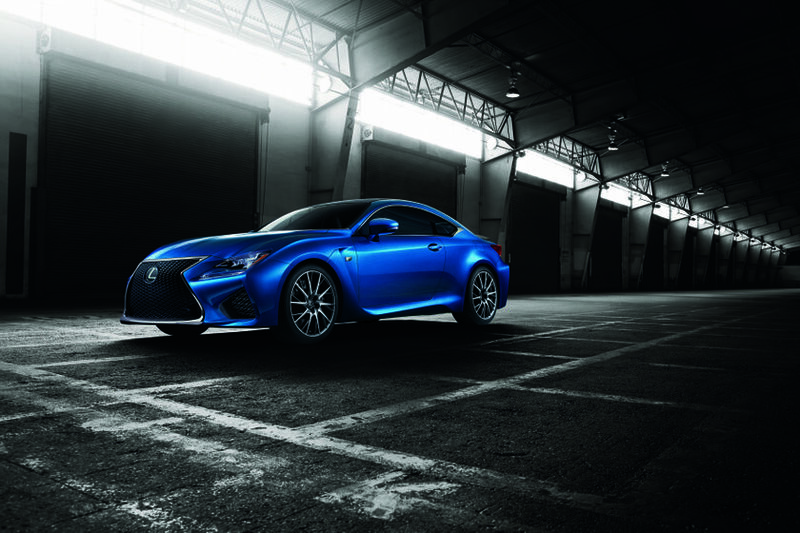 “I've built RC F to be enjoyed by all enthusiasts – no matter what their level of expertise. “There's a misnomer that racing cars are hard to drive. In fact, they're easy in the right hands because they've been purpose-built for the skill level of their drivers. 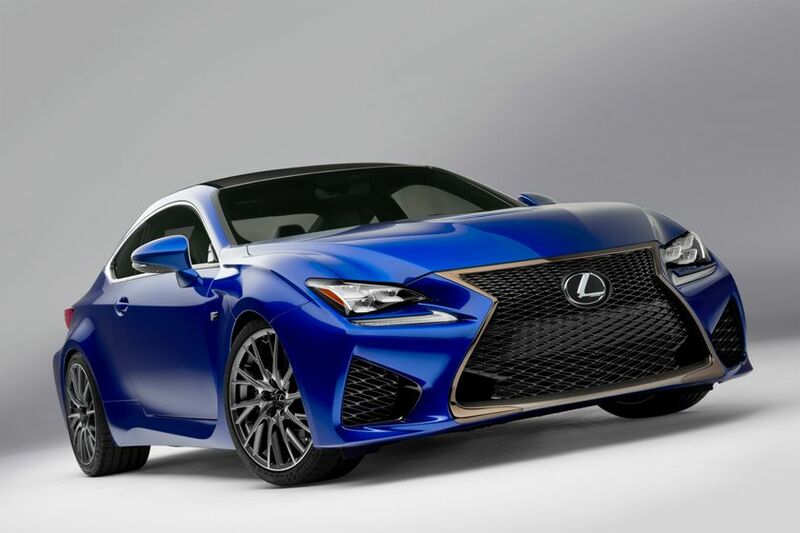 It's the same with RC F.
The most powerful Lexus V8 F model ever-built, will use an all-new 5.0 liter, 32-valve engine with cylinder heads and moving parts that provide increased maximum power at higher engine revolutions than has previously been possible. 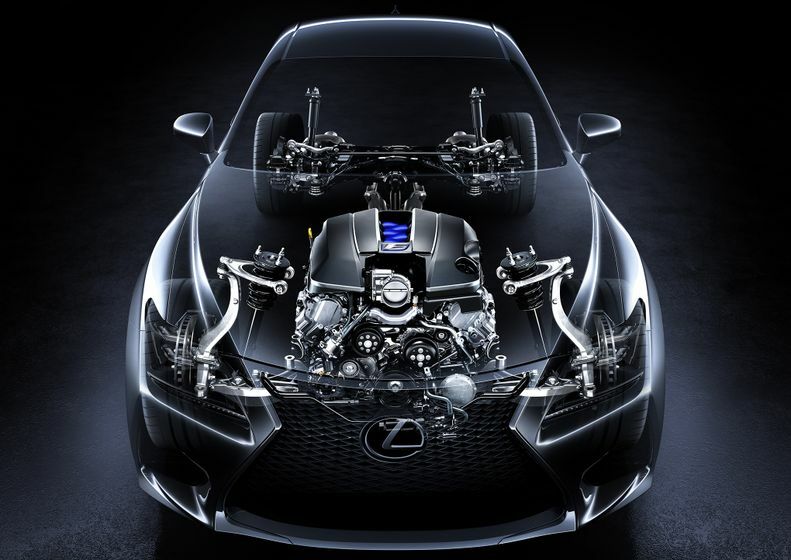 For the first time in a Lexus performance engine, the RC F uses the Atkinson cycle at cruising speeds for enhanced fuel economy and then it switches to the Otto cycle at higher revolutions to develop impressive performance levels. Driver engagement has been made possible by purpose designed sound and power delivery sensations. A uniquely tuned eight-speed Sports Direct Shift (SPDS) transmission improves linear response to accelerator-pedal operation, which lets the driver better feel the torque and power as it is applied and a system of regulating induction and exhaust sound helps create a deep tone up to 3000rpm, and a higher-pitched tone as revolutions rise freely above 6000rpm. The Lexus RC F uses the world’s first Torque Vectoring Differential (TVD) in a front-engine rear-drive vehicle, designed to heighten driving enjoyment. TRACK for consistent, stable behaviour, ensuring the vehicle stays on the intended corning line as the driver applies more throttle. As in the Lexus LFA supercar, an active rear wing is incorporated into the trunk lid to provide down force at speeds of more than 80kmh. The wing is a highlight of the RC F’s aerodynamic grip and stability package which also includes careful tuning of the flat underbody, the ducts at the rear of the front bumper and front fenders, and strategic placement of aero stabilising fins. The foundation for the vehicle’s mechanical grip is the high rigidity body which has large cross-section rocker panels and a highly rigid front lower brace, as well as using specialised Lexus manufacturing techniques, including body adhesives, laser-screw welding and multi-spot welding. Grip is further enhanced through use of a wider tire and wheel assembly. The RC F has coil-spring independent suspension front and rear, with monotube gas dampers and ball-jointed stabiliser bars. Unsprung weight is enhanced by the adoption of new 19-inch diameter forged aluminium wheels which minimize tire/wheel assembly mass and maximise rigidity. 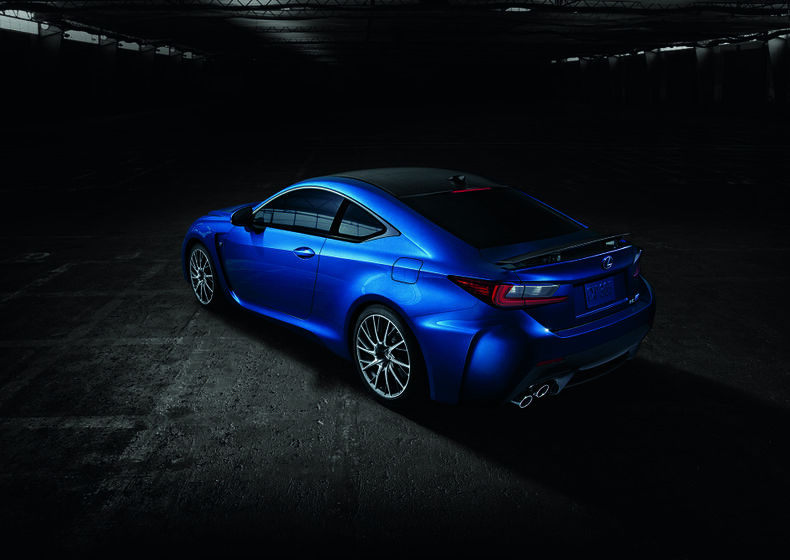 The Lexus RC F stands out for the visual aggression it adds to the stylish body of the new RC coupe on which it is based. 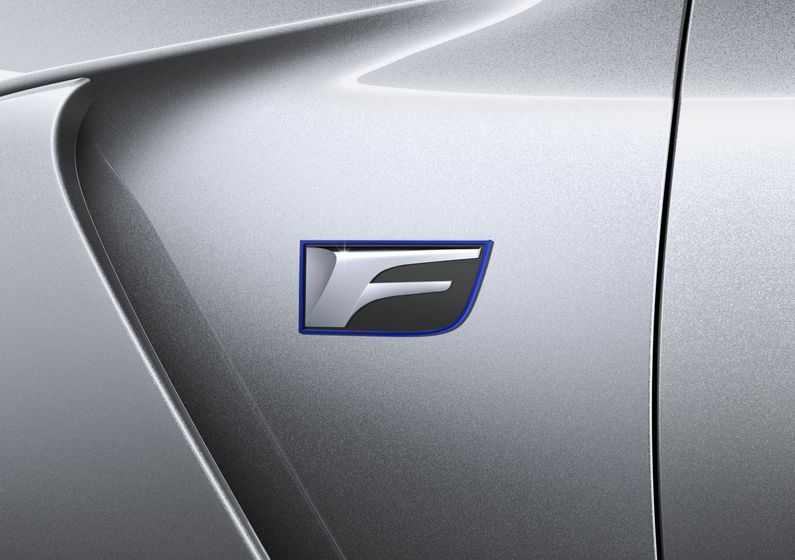 It features its own version of the Lexus signature spindle grille which dominates the front of the vehicle, with a subtle “F” motif embedded in the mesh below the Lexus symbol. 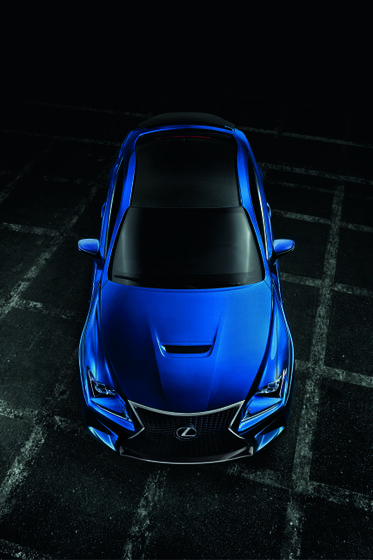 The profile view also is aggressive because the RC F has a unique front bonnet which raises the peak of the vehicle, creating a powerful side view. 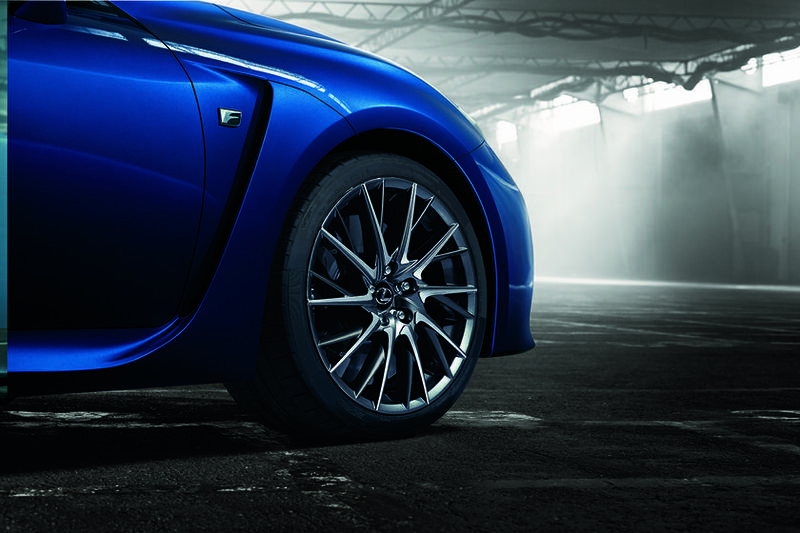 The RC F takes design cues from the Lexus LFA supercar, especially in essential air cooling and aerodynamic devices. 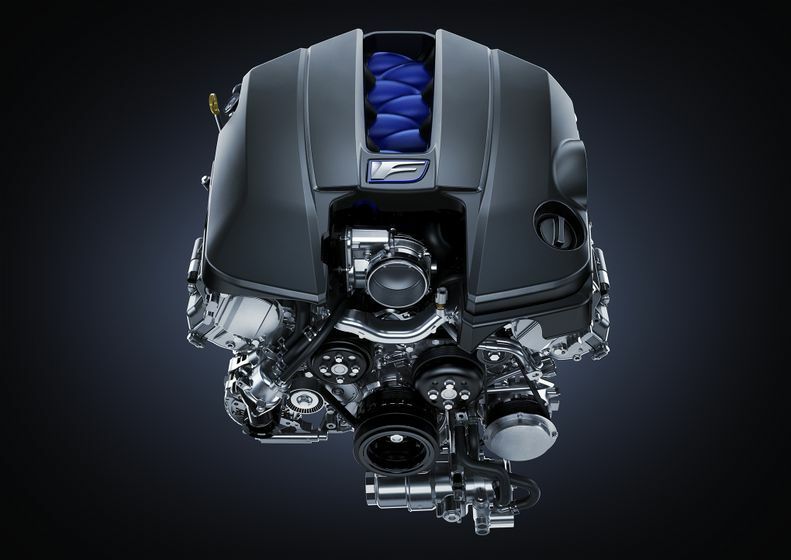 Its bonnet air outlets, such as those on the LFA, combined with front cooling ducts contribute to engine cooling and overall vehicle stability. To the side, front quarter ducts in the shape of an L also aid cooling performance while adding to the aggressive stance. 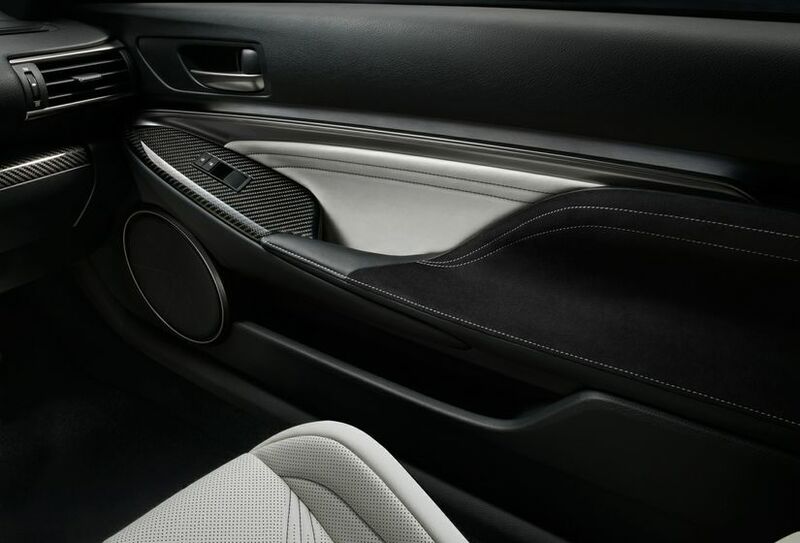 Uniquely designed components, including instrument meters, steering wheel, seats, ornamentation and pedals, convey a sense of connection with the driver that only a Lexus F model can achieve. . 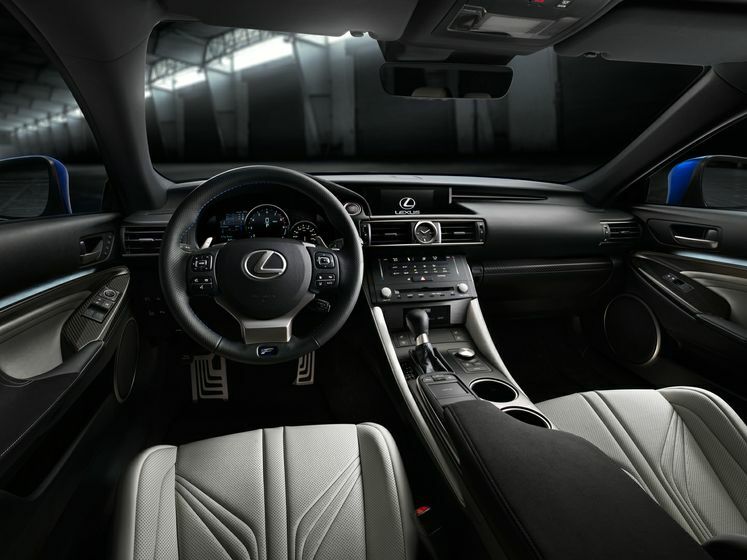 The RC F’s all-new instrument meters are further developed from LFA while also referencing aircraft cockpit instruments by providing a wide range of information in easily read form depending on the drive mode being used. Driver connection has been paramount. 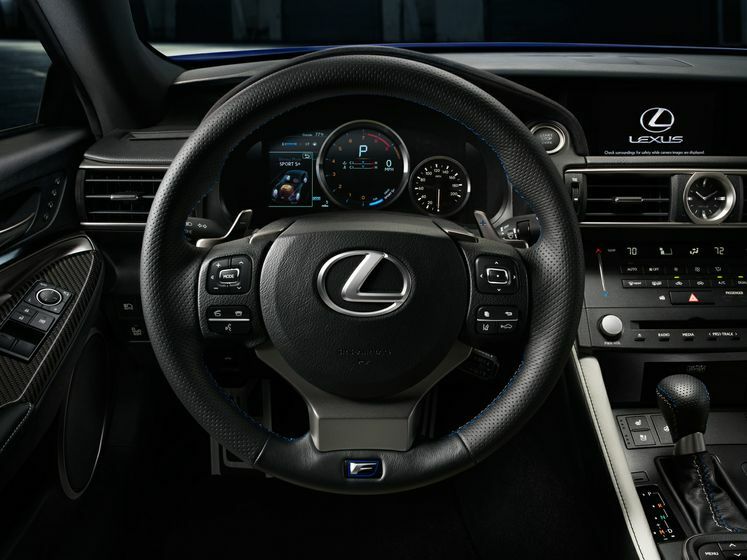 The RC F debuts a Lexus first elliptical cross-section thick grip steering wheel to offer greater control during performance driving. Particularly the placement, shape and operation of paddle shifters make it easier to enact gear changes during track driving and in other performance circumstances. 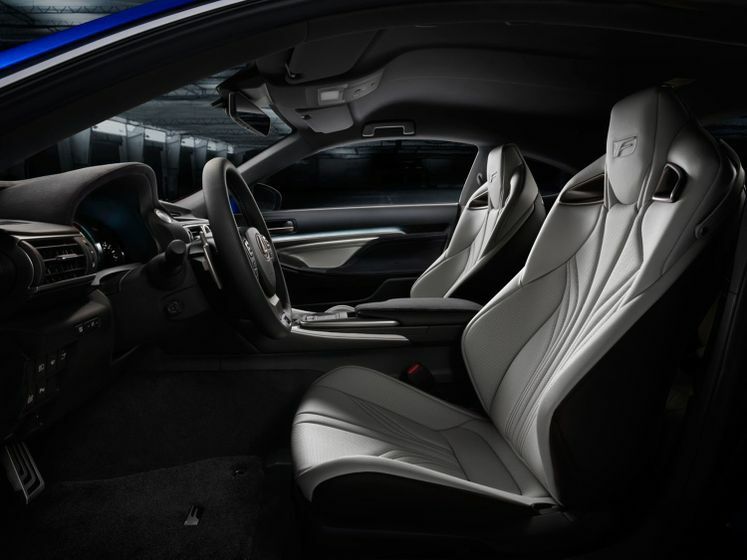 The all-new high back seats of the RC F have been designed to resemble the look of tight-fitting athletic sportswear to support and cosset occupants. An integrated foaming technique achieves a highly supportive and taut fitting seat that does not suffer from movement of the trim material.